Below are a few photos taken at my site over the years, begining with my first house in 1996. 2000 was the only year I had any martins in my gourds. In 2001 I lost my colony after having removed the metal house and converting all the round holed gourds to SREH crescents. It was too much change at once. However, we learn from our mistakes! 2002 I replace my gourds with a Trio Castle and continue to use the Trio to this day. 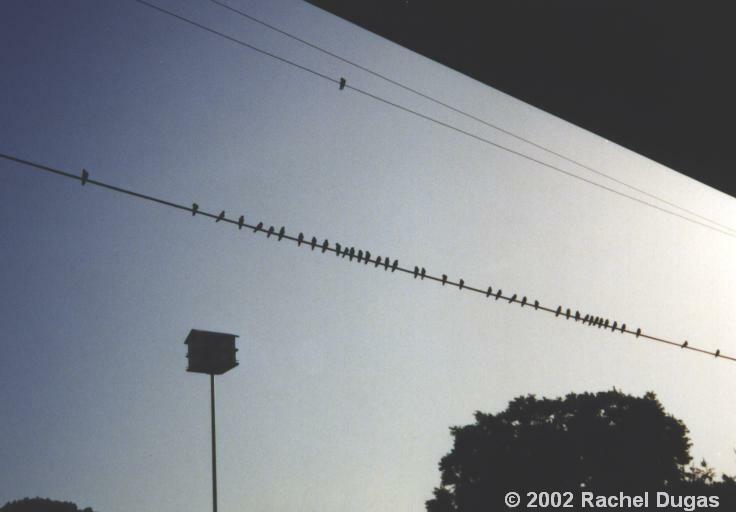 Not long after the sun was up the martins from my original house would line up on the wires with their fledglings, before a day of flying lessons! The super-gourd setup is just to the right but out of view on this photo. I had this setup in 2000 and 2001. 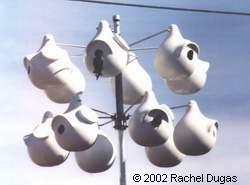 I had one pair nest in a gourd in 2000 even though others looked but didn't stay. Following are some photos of the young from this pair. Originaly there were 7 eggs. It has been found that martins have larger clutch sizes in large 10" gourds than they do in the smaller 6x6 compartments of a house. 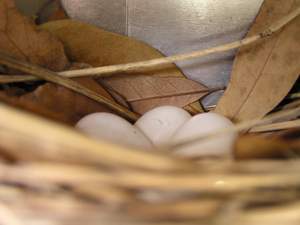 Unfortunately I found 2 eggs broken on the ground one morning, kicked out by House sparrows. 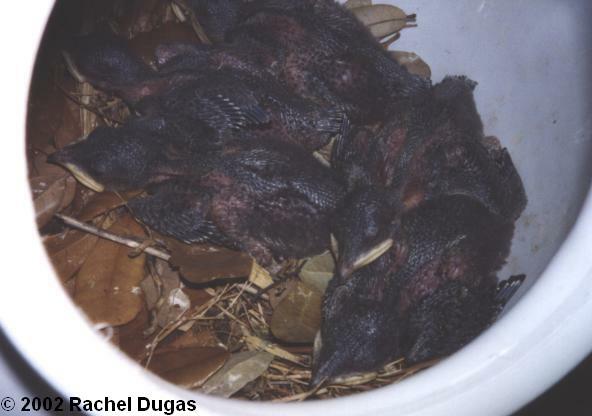 This is why it is so important to control nonnative Eurasian House Sparrows and Starlings, either by trapping and/or shooting, because of the damage they can do to all cavity nesting native birds. Although you can barely see them in this photo, they are there! At this point they pretty much look like little worms (or aliens as some call them!). At eleven days old here, the nestlings are starting to get downy feathers and their primary wing tips are developing more color as they grow. Unfortunately the photo is a little dark to show much detail. Once out this lil' guy found his way to our deck. He really didn't know what to make of this whole new world he found himself in and didn't know what to think of me! This was the last young I had until this year, last year having lost my colony. This year I had the one pair which had 4 young. In 2002 I went back to an aluminum style of Martin house, a Trio Castle, which I still use to this day. It is similar to what I had 7 years ago. I could still hang some gourds underneath and had 3 naturals, all with crescent entry holes. This year they paid no attention to the gourds. The small round hole on the bottom level is the Sparrow trap door, which is left on permanently and moved around as needed. Eurasian House Sparrows are a constant battle and is a bird that will always need control at a Martin colony. Had I left the sparrows to take over this year, they would have done just that, all 51 of them! 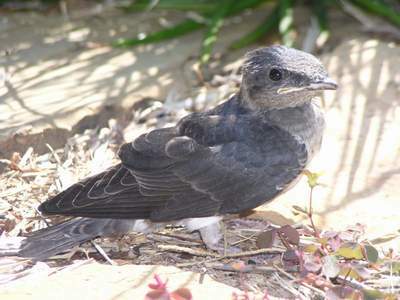 But they weren't allowed and the martins could generally live free from the threat of these birds and in peace, able to get on with their nesting duties for which they flew thousands of miles from Brazil to do. 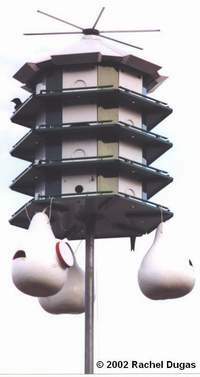 This was the one and only mating pair I had for 2002. Betty is sitting on her 4 young, Barney is on the lookout, ready to chase off any martin who dares come near his castle! 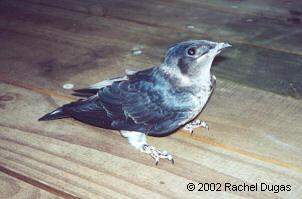 However, there were about 7 or 8 Martins always around the house or on the wires at any time. I provided both SREH (Starling Resistant Entry Holes) as well as a few Excluders (bat shaped entry holes); both designed to help prevent the entry of Eurasian Starlings which are one of the biggest threats to Martins and their young. The compartments behind these doors were modified to a larger "double" compartment to give the much needed room for nesting Martins. However I did provide 3 compartments with round holes just to give the Martins a choice but left these compartments at the smaller original size of 6x6. Starlings will not nest in such a small compartment. They did not nest in the cresented compartments this year. Feeding is constant! Both the male and the female bring in food. Here the nestling is now sticking his head out of the hole to get the food first. Food consists of large bugs such as dragonflies, cicadas, grasshoppers, etc., but not mosquitoes! From studies done on dead martins, where their stomach contents have been checked, only 3% of their diet consists of mosquitoes. 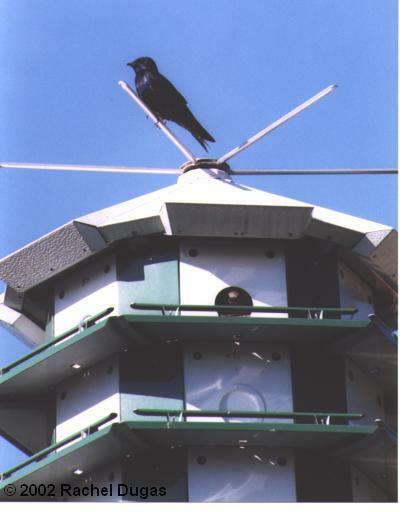 It is false information on the part of manufacturers that say Purple Martins will eat 3000 mosquitoes a day! 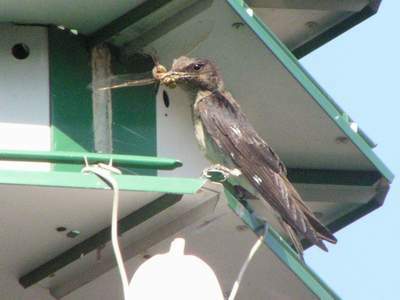 The actual truth is that Purple Martins eat larger insects such as dragonflies - for which mosquitoes are a main part of their diet. So, Martins may actually increase the population of mosquitoes! Mosquitoes are low flying insects, usually around the height of peoples bodies! Martins feed much higher up. Also, most mosquitoes come out at night, Martins during the day. So there you have it. If you ever see a Martin house for sale and the box reads - "Martins Eat 3000 mosquitoes per day," well they don't. Now, 3000 bugs? That they can do! 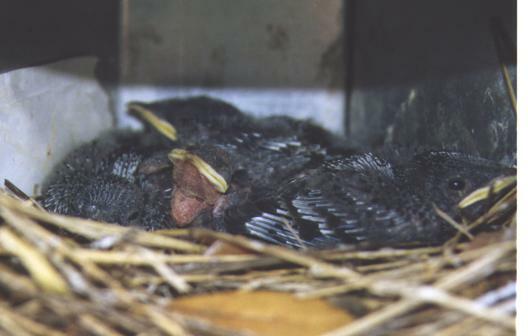 Nest checks provide the perfect opportunity to check the nestlings over for any problems. 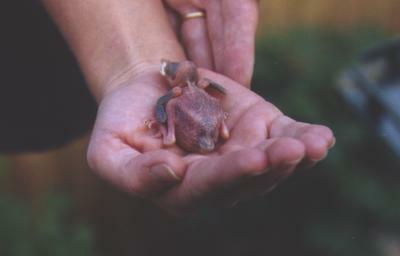 The handling of hatchlings will not make the parents abandon their young, as is the old wives tale! Doing nest checks every 4-5 days is a very important part of being a Martin Landlord and actually increases the survival rate of young Martins because any sign of problems regarding predators, Starling attacks, mite infestations etc. can then be seen and the appropriate measures taken. 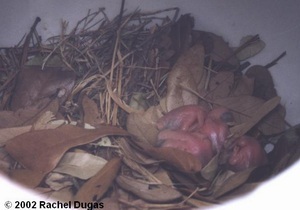 The nestlings here are about 13 days old when this photo was taken. There are 4 of them huddled up together on a bed of dried grass, mud and leaves. (Their favorite leaf in my area is the "Live Oak" leaf. As you can see they chose a 6x6 compartment instead of a larger compartment, and is really not large enough for them. 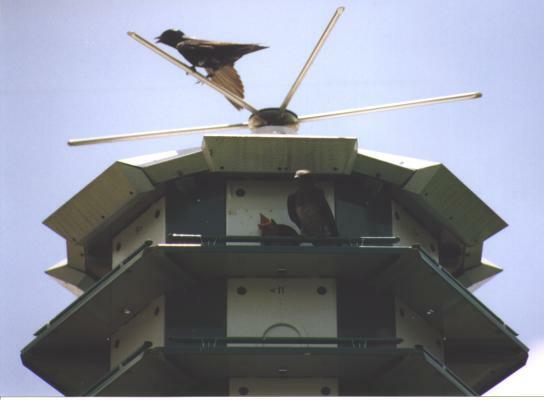 On average, a 6x6 nest would hold 5 young and 2 adults. When you realize that each adult is 8" and two adults will sleep in the compartment along with the young, the compartments of most commercial housing are just not large enough. Compartments can be enlarged by blocking off every other hole and drilling a 2" diameter hole in the inner "connecting" wall. This would make a 24 compartment house into 12. Although this does not make one large compartment (and many have removed this "inner wall" completely, without structural weakness to the house), it still gives one whole chamber to the nestlings and the adults can then come and go much easier when delivering food etc. Also, with the nestlings not being directly behind the main entry hole they are also safer from arial predators such as owls and hawks. Many manufactures now are producing housing with already modified compartments. Home made housing can also be made with larger compartments, the best size being 6x6x12 for housing and 10" for gourds. Gourds are wonderful for martins, IF they can get used to them, being very large and spacious. 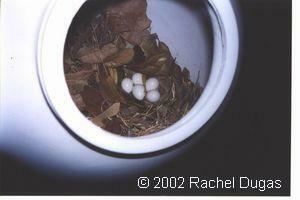 The average clutch size for nestlings in gourds increases from 5 to around 7. Well this was the last little guy to come out of the housing. He did not leave the housing until 3 days after the others. He was the last one to hatch and the last to leave. Unfortunately this is the one who still was not quite ready to fledge. His parents had also stopped making frequent food trips to the housing after the other 3 had successfully fledged and subsequently this little one did not get the food in the last few days that he needed. He would land on the ground and not be able to fly back up to the housing. I placed him back up there a couple of times after finding him on the grass but the last time he tried he just didn't make it. Its sad to see a little one just not quite make it but ... that's nature. The strongest survive. For some reason the Martins at my house have always used the brown leaves, as apposed to green which most use, to line their nests with. It is presumed the green leaves give off some chemical which is like a natural insecticide. The brown ones must work just as well! Also there is no mud used in this nest, its mostly straw and some fine twigs piled high towards the front, cutting the entry hole to half the size (why they did'nt use the cresent entries this year I don't know?) and hollowing down at the back. The material is very different to the flat mud nests laid in the original '96 housing, but then they are SY (sub-adult) birds after all, so maybe they're still learning which material is best to use, or maybe the straw is just more abundant now in this area. Here she's taking some huge dragonflys to the young! She had 4 young in this cavity. I had a total of 7 pairs in the trio this year making this the best year I've had, the previous couple of years just having one pair. 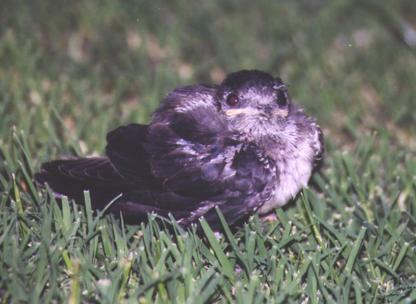 Very often the new fledged birds will land on the ground for several hours before flying again. It is important at this time, if possible, to make sure no house dogs or cats be allowed outside until they have safely left the ground. 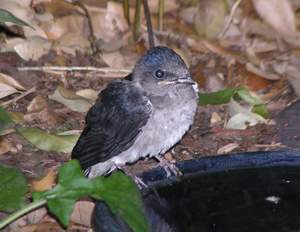 This bird found the little bird bath that I have on the ground. He took several drinks while he was there and was content to perch on the side.